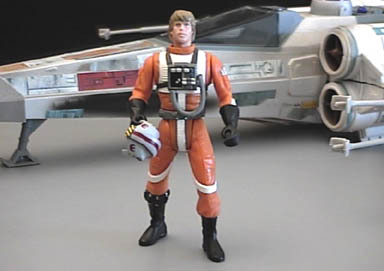 This was done several years before Hasbro's latest (and finally decent) X-Wing Luke. I did a simple head switch with a Biggs figure. I wanted to do more so I repainted the middle strap white to match the straps hanging on his legs. I also painted the cylinder things on his shoulder silver and added some gold to his belt. The helmet is the same one I made for my my Snowspeeder Luke. They have to share.